Sandy Straits and Beyond: They are Still There! I managed to get one good kayak last week without too much wind and without the clouds rolling in just when the tide would be right. I went out to the Airport Roost to check what birds were there. The sea looked beautiful and calm until I came out from behind the trees and rounded the point and then little waves started to lift the kayak and I wondered if I could take any good photos at all with that much movement in the kayak. A Gull-billed Tern flew low over the mangroves where the Grey-tailed Tattlers were roosting and up they flew and off to the other side of the bay. However, when I looked closer there were still some sitting in the trees so I let the wind and waves drift me in and sat still with the camera ready. When I looked closely at the photos I had taken I realized I had photos of Terek Sandpipers instead of Tattlers. These birds look very similar in color and size but the Tattler has a straight bill and the Terek has an up-curved bill. This is the only roost on the southern end of the bay where I have seen Terek Sandpipers but I haven't seen them for a couple of years so wasn't sure if they were still there or not. I am sure (now!) they must have been, but when they all fly off quickly I have not been fast enough to ID the two species in flight. 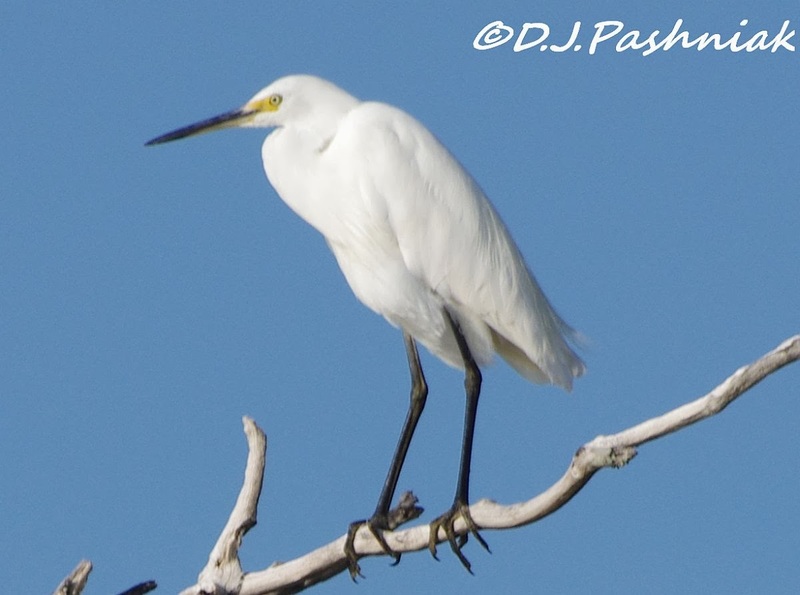 There was a Little Egret sitting up in a dead mangrove and looking very beautiful against the blue sky. There must have been a lot of water washing over the sand when the tide was very high and the winds were pushing the waves in even further. 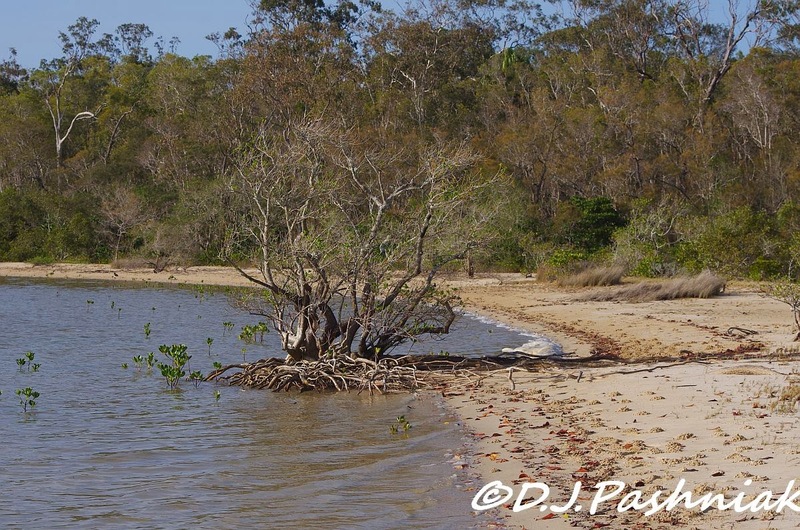 Some of the mangrove trees that have stood on the beach for at least the last 10 years had the sand washed out from around their roots and have lost their leaves. It will be interesting to see if they manage to survive or if they wash right out in a few more months. I decided to enjoy the rest of my kayak by paddling up the creek where the winds would not be blowing. I always enjoy the scenery and the quietness in this area. 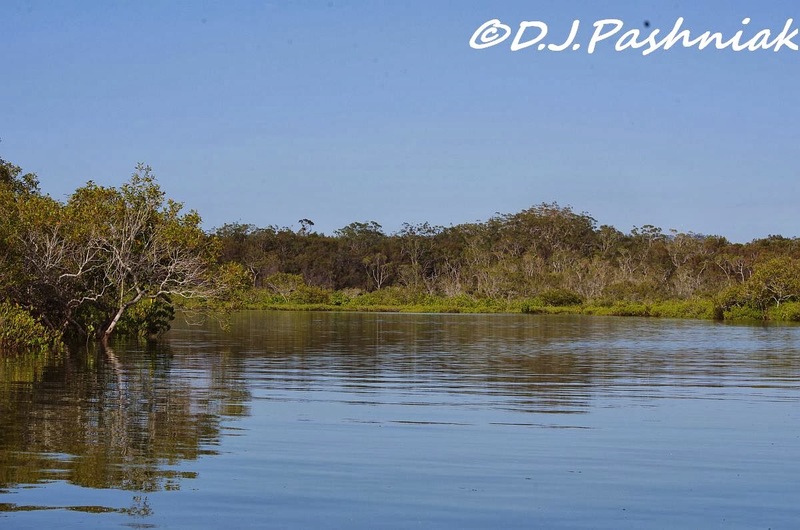 There is one place up the creek where the swamp grasses grow down to the water and on higher tides even get covered with water. Shorebirds often come to this area when they have been disturbed on the other more open roosts. This morning there were a number of Pacific Golden Plovers. Some were beginning to show black blotches down the front which will eventually become the solid black of their full breeding colors. As I turned to go down the creek towards the open sea the black clouds had again rolled over and turned my perfect blue morning into a very dark day again. 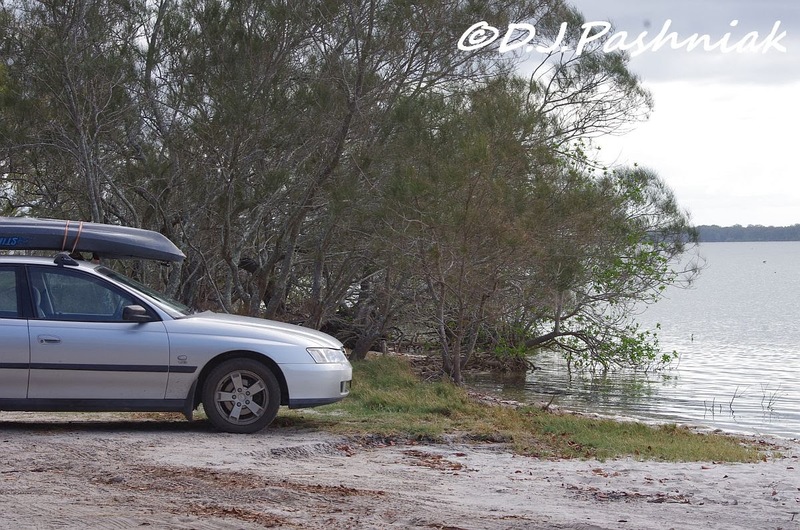 This is a photo of my car with the kayak loaded on top and standing right where the fisherman was standing in the very high tide photo that I showed on the blog last week. Will have to come kayaking with you again soon if the weather allows. Hope it rains we need it. Thanks Neil, Please talk to the weather-man for me!! Thanks Carol, sometimes you get lucky when you least expect it! Hi Therese thanks for commenting. It's fun to see high tides but I am glad that I can park the car in the same place most of the year and not worry too much. A nice surprise and sighting of the Sandpipers. I can see their upturned beak. The Plovers are adorable birds. Lovely birds photos and scenic shots. Thanks for sharing your outing. Have a happy week! Thanks for commenting Eileen. Terek Sandpipers were some of the first shorebirds I saw around here and finally ID'd them so it is extra good to know they are still here. Really nice plover shots!!! Great birds presented today.....plus some nice looking weather. I've never heard of Terek Sandpipers before......very interesting. Thanks for commenting Chris, if I am patient I hope to get some really good photos of the Plovers when they get their full breeding plumage. 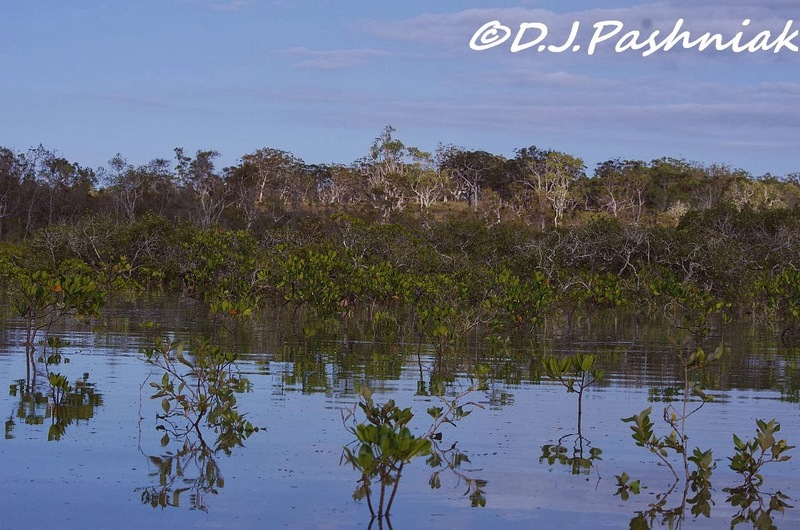 Beautiful bird photos and a great area, sometimes some species can be hidden for years. Thanks for commenting Christian. I enjoy my area and the birds around here no matter how many times I go out to the same place. So unusual to see waders roosting in a tree like those Tereks. More than unusual for me in that I'm pretty sure I've never seen it over here. Great shot of the Pacific Golden Plovers. Hi Phil, There are three species of migratory shorebirds that prefer to roost in trees over here - Terek Sandpipers, Grey-tailed Tattlers, and Whimbrels. I do see them on the sand sometimes. The trees of course are Mangroves and I wonder if you even have them over your way. I do like a "computer tick" - if you see what I mean! Sandpipers are so wonderful.... I know there are some endangered plovers of some kind on our Oregon beaches but I've never been able to identify them (if I've even seen them). I love all your shore pictures....and so glad you got some decent weather to get out there in that kayak. Hi Sally thanks for commenting. Shorebirds can be hard to find unless you are lucky enough like me to live in a wetland area used by so many shorebirds! I saw numbers of Plovers in coastal Washington state when I visited there a few years back - but they were all different from the ones I see down here - and not easy to ID, I thought! Terrific captures. That Egret is beautiful. I need to go for a paddle, but it will weeks before the snow melts! The spotted dove is likely to be the same you have. They seem to be introcuced from Asia. Hey, Mick! 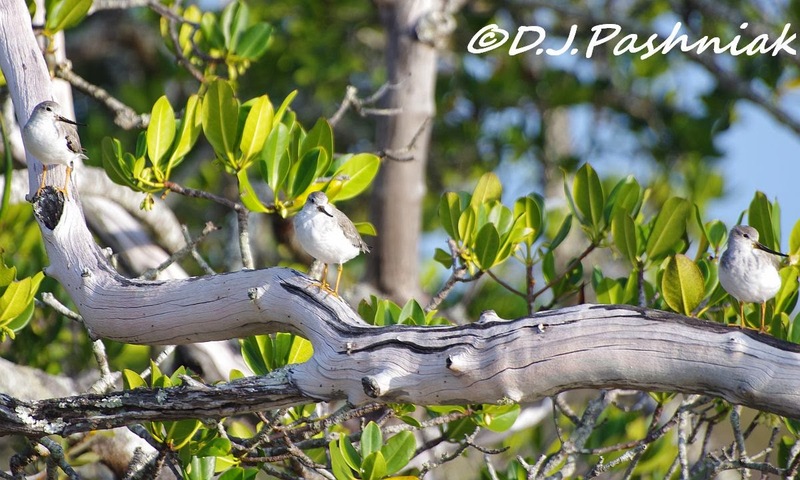 Wonderful photographs of the Terek Sandpipers in the Mangrove! That, and the Tattlers would be new birds for me. 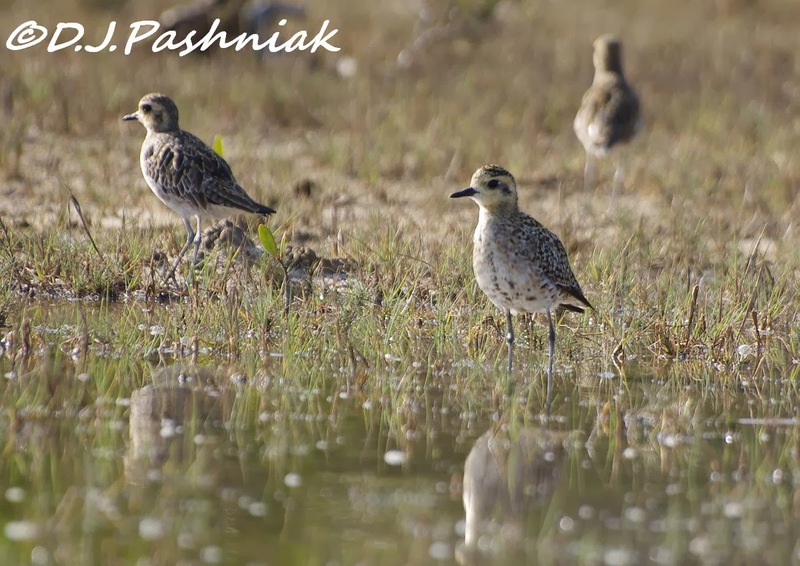 The Pacific Golden Plovers will be really stunning once they're in complete breeding plumage. Great shots of them in transition! I really like the photos of the quiet creek. My kind of place! Thanks for your comments Wally. That creek is so beautiful and quite close to houses and people - but so far nothing is built too close. The Pacific Golden Plovers look delightful. There is always something new to observe once out in "the wild". Thanks for commenting Karen. I hope I can get more photos of them as they go into breeding plumage. Wonderful scenic place. Nice shots of the birds. That looks like a great way to spend time. Love the plover photo where you can see the reflection. Thanks for commenting CM! It's certainly a very relaxing way to spend time. Hi Carole, I agree - the kayak is always an escape! Thanks for commenting. 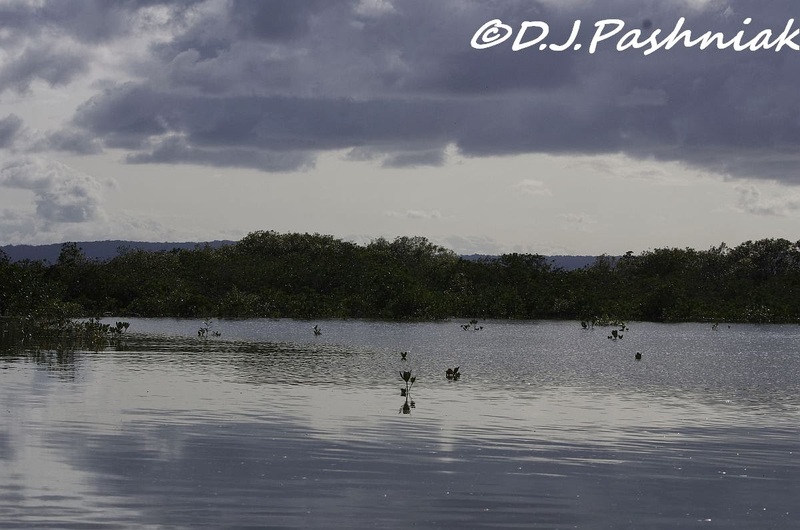 Amazing to get the Sandpipers, the area you where in looks magical, we can only dream of places like that. Thanks for commenting Gordon - if only the weather would cooperate it would be a perfect place but you can have too much of any good thing - even the sun! and 34-36 degree temps are too much for me! WOW,what a beautiful area and the birds are amazing!